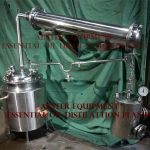 Essential Oil Distillers is suitable for the extraction of various flowers and leaves which contain essential oil. It adopts water vapor distillation apparatus for water distillation method and water proof distillation method, so the extraction of plant volatile component is effectively, this equipment is suitable for enterprises to set up production near the plant origin place. The equipment is new, multi functional and multipurpose plant essential oil extraction unit. the equipment can collect the plant essential oil, aromatic plants, and other effective ingredients efficiently. This equipment is made of SUS304 stainless steel with special frame. It has Special condenser design which can extract the oil efficiently. 1) of the material into the extracting tank distillation in the basket, basket distillation for orifice plate structure, distillation blue can be on-demand materials, such as fresh flowers and plants is placed at the bottom of the retort to join a certain percentage of pure water, water not overflow the distillation blue lowest place.General material liquid ratio of 1:3 is best. (can also add a moderate amount of additives according to the technical requirement). 2) open the extraction distillation tank heating system, make the distilled water heated to set temperature (generally for water boiling temperature of 100 degrees Celsius), extract the normal start.When distilled water temperature reached 70 degrees Celsius, open condensate valve. If equipped with ice water unit need to be water temperature reached 50 degrees Celsius is open cold water unit, and maintain stability of the condenser water flow rate. 3) distillation extraction began, oil-water separator bottom by glass pipe dynamically observe essential oil extraction effect. 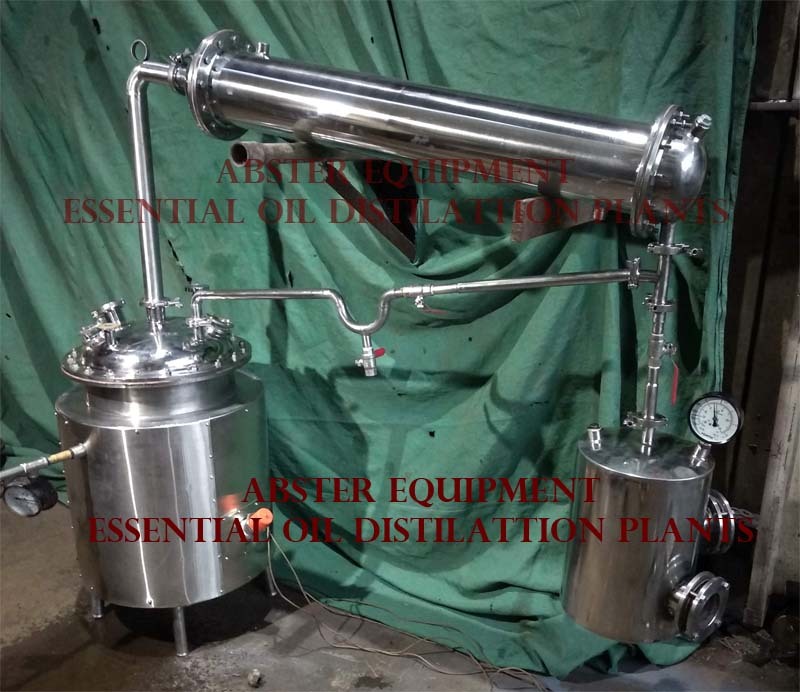 4) distillation extraction began, condenser condensate must be open.General plant essential oil extraction time is longer, mezzanine boiler temperature can be set to 120 ~ 130 degrees Celsius, distillation tank temperature setting to 102 ~ 105 degrees.To keep the distillation tank water boiling.Ensure that the steam is enough. Operation experience: before distillation temperature reach the set value, can be set higher interlayer boiler temperature, such as 150 degrees, let the temperature rise more quickly, when the temperature difference 10 degrees or so close to the set value, the temperature of interlining boiler to normal, such as 115 degrees. 5) general distillation extraction time is 3 ~ 5 hours, (according to the roses, for example, 3 hours yield efficiency 84.783%, yield efficiency 95.652%) 5 hours after the distillation extraction, shut off the distillation extraction tank heating system, etc. After 20 minutes in the closed cooling water. 6) condenser opens in the extraction tank temperature to 80 ° C, while ensuring the condenser top open open. 7) condenser in normal work, the upper openings with water vapor.If there are any vapor emitted that condensed water temperature too high or low condensed water.If there are any conditions, can use cold water cycle refrigeration unit.It can better improve the effect of the extraction of volatile oil. 1) the flowers and plants such as the material directly into the distillation extraction tank, the bottom of the retort adding suitable amount of pure water, half of the volume of water not overflow the retort, generally for 1/3 of the tanks as well. (can also add a moderate amount of additives according to process requirements, generally increase the concentration of 2.5% concentration of sodium chloride aqueous solution to distillation, obvious effect).